** To be used with the Quickie Aircraft Kit. Also, purchasers of the plans are entitled to a $150.00 discount on the purchase price of a Quickie Package 1 Kit. California residents should add 6% state sales tax. Quickie Aircraft Corporation is located on the east end of the flight line at the Mojave Airport, Mojave, California, which is located approximately 80 miles north of Los Angeles. You are welcome to come by to see N77Q, the Quickie prototype, to ask questions, and to bring in parts of your Quickie for inspection. The building number is 68. .....We are normally open from 9 to 5 on Tuesday thru Saturday, but you should call first if you are coming from far away, since we occasionally must close the office to attend a flyin, conduct business, etc. Weather permitting, each Saturday at 10:00 we will give a flight demonstration with the Quickie. .....When writing to QAC, always send a stamped self-addressed envelope along if a reply is necessary. .....We expect to finalize the tuned exhaust system for production within 45 days. The system will add about 0.7 h.p. and will complete the 22 h.p. package. .....We just recently began testing a hydraulically controlled, variable pitch propeller on our N77Q. We plan to test it for over 50 hours before making a decision on availability for our homebuilders. Our next newsletter should contain performance data; we are looking for a significant reduction in takeoff distance, and a considerable increase in the rate of climb. During March, we flew N8OQA, a Quickie that we built to capture several World and National records in both the 250 kg. and 500 kg. classes. Flight testing of the aircraft is proceeding at a slow pace, and it will probably be after Oshkosh before any record attempts are made. We have a standard fuel capacity of 30 gallons, and room for 10 more! .....We should also add that any builder who desires to go after any of the current records can count on our cooperation, as we want to see the Quickie find a home in the record books. Finally, there is one eminently qualified gentleman that we know of who would like to borrow someoneâs Quickie for about three months so that he can fly it around the world! If anyone is interested in working with him on this project, please contact QAC for details. 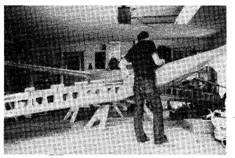 Robert Fischerâs Quickie being load tested prior to first flight. This optional test will remove any doubts about the structural integrity of the finished aircraft, as well as contribute a few more gray hairs to the builder! 1. In order to achieve sweepback on the canard, the foam cores must be skewed to a parallelogram shape. On page 5-3 for example, at the bottom of the page on the RT CANARD BLIO.49 sketch TYP indicates that both ends of the block must be skewed by 1.2”. The sketch is not in error when it shows a parrallelogram shape to the block. TYP means that the dimension is typical at at lease one more location on the drawing. 2. Please incorporate all Plan Change Notices (QPC’s) into your set of plans as soon as they are received. This will save confusion, and needless phone calls to QAC. 3. When writing QAC, please include a self-addressed stamped envelope if you need a reply. If you are asking builder questions, please mark “builder question” on the outside of the envelope to speed the delivery back to you. 4. Turn to Page 11-1 of the plans; read completely the installation of the pulley in each wheel pant. Put a note on the page to verify after installation that the pulley does indeed rotate after installation and cure cycle. Next, read the rest of chapter 11. Note that if the proper sequence is followed, the I” square piece of aluminum that the Kl000-3 nutplate is riveted to is kept in place not by being bonded to the foam (if that was so, it could he dislodged with finger pressure) hut by the glass lamination detailed on page 11-4 that covers the inside of the wheel pant. If that glass lamination does not cover the aluminum plate, then it will fall down into the wheel pant on the first brake application. Rattling around in the wheel pant, it could easily lodge between the pant and the tire, causing the tire to lock up. 5. For operation in snow, mud, or gravel. caution must be exercised not to pack foreign material into the wheel pant around the tire, thus increasing the rolling resistance, and, in extreme cases. causing the tire to lock up. 6. When taxiing, taking off, or landing a Quickie, the pilot’s feet must remain on the rudder pedals and exert tension on the cables. We have heard of several minor groundloop incidents as a result of inexperienced taildragger pilots not maintaining tension on the rudder cables. Gary LeGare, Quickiec Canadian distributor, picking up 9 kits last February at Mojave (Yes, it really does rain in the desert). Gary has sold over 30 Quickies in Canada. as well as just completing several construction seminars. .....In the last 60 days, we have received over 250 inquiries from prospective Quickie Dealers. 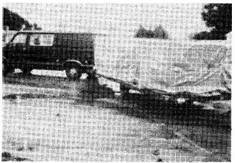 We expect to have a basic network in place by Oshkosh, 1980, and the complete network functioning by January, 1981. Many prime areas remain open, including Los Angeles, Dallas, and Minneapolis. Any interested parties should contact QAC for complete details. .....Once in place, we expect the Quickie Dealership network to provide not only increased pilot awareness of the Quickie. but also to achieve a higher level of homebuilder support. .....Elsewhere in this newsletter, you will find a listing of current dealers.